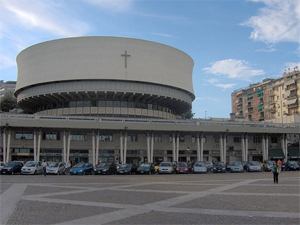 The Metropolitan Cathedral of San Lorenzo is the most important place of Catholic worship in the city of Genoa. Built between 1100 and the end of 14th century, its facade has three Gothic entrances made by the French masters in 13th century. The themes represented by the bas-reliefs and high reliefs depict Christ with San Lorenzo and the Tree of Jesse. On both sides of the staircase, in front of the facade, there are two lions belonging to the Gothic period and other lions in relief that are above the central portal made by the School of Benedict Antelami. Two other Romanesque portals are located in the two sides, the portal of St. John on the North side and the portal of the Gotthard on San Lorenzo road. Above the middle door there are two frescoes depicting the Last Judgement and the glorification of the Virgin (the frescoes were painted between the late 13th and early 14th century). In the right aisle, you can find a grenade that during the Second World War broke through the roof of the cathedral without exploding. Along the left aisle, visitors can see the chapel of St. John the Baptist (built between 1450 and 1465). At the end of the right aisle, there is the treasure museum of San Lorenzo, a masterpiece by Franco Albini, completed in 1956. 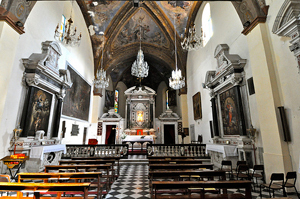 The Basilica of Santa Maria delle Vigne is one of the oldest Catholic churches in Genoa, located in Piazza delle Vigne, in the folkloristic district of Maddalena. The current main facade of the basilica is the most important work of Hippolytus Cremona in late neoclassical style. The portal on the right side of fifteenth-century style is surmounted by statues by Giovanni Donato Rodari and Gaggini. On the left side of the church, under the arch that crosses the base of the tower, there is a tomb dating back to 1304: it is the tomb of Anselm of Engraved, the alchemist and physician to Pope Boniface 8th and King Philip the Fair of France. The Basilica of Santissima Annunziata is a religious building, located in Piazza della Nunziata, in the district of Prè. The Basilica is one of the most representative churches of Genoese art and was built in late Gothic style and immediately dedicated to the patron saint, with the name of St. Francis del Guasto. 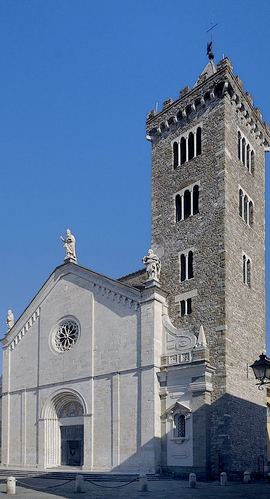 The Cathedral of Sarzana was built in 1204 and was dedicated to Santa Maria. The church is a typical example of romanesque-gothic style because of the white marble façade, the gothic rose-window and two huge sides which date back to the XVII century. The façade was a work of Leonardo Riccomanni while two statues of Sant'Euchiano(in the centre), Sergio VI (on the left) and Niccolò V (on the right) are more recent(1735). The most ancient part of building is the bell tower with complex church windows (monofore and quadrifore) which is the rest of the old rural church( called Pieve) of San Basilio. There's a perfect latin plan with three naves divided by arches. One of the most interesting aspects is the wood coffer ceiling, carved by Pietro Giambelli between 1662 and 1670. Furthermore there are famous paintings belonging to the Renaissance and Luca della Robbia's terracotta. Besides its architectural elements, the Cathedral of Sarzana is really famous for hosting the most ancient italian painted cross: Maestro Guglielmo's one, which is in romanesque style and dates back to 1138. This cross is the perfect example of Christus Triumphans before the representations of Christus patiens, according to the religious iconography. Other symbolic element, visitors should admire in the Cathedral of Sarzana is the relic of the Blood of Christ which is kept in the chapel of the "preziosissimo sangue" on the right of the main altar. 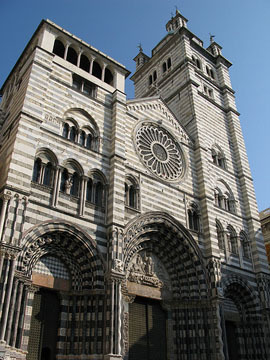 The Church of Santa Maria Assunta, known also as the Cathedral of La Spezia, lies in the historical centre of the city in Giulio Beverini's square. This building has an uncertain date of construction and it is indissolubly connected to the history of La Spezia. From documents, we know only that the building appeared for the first time during the powerful Republic of Genoa, when la Spezia was a little village without any kind of development. At that time the building wasn't a parish. Besides its complex history, Santa Maria Assunta church is extremely important for his exterior and interior decoration. First of all,the plan of the church is developed in the so-called Latin Cross, and has a three-naved transept with six white marble columns of Carrara. From an architectural point of view, the church shows late gothic style characterized by groin vaults, pointed archs, walls striped black and white and a rose window. The interior of the church presents two chapels: the Misericodia and the Immacolata ones. Another important element is the ceiling which is made by grey stone ogivas. What is more, there are many important paintings in the walls which belongs to the 14th century, such as the "Moltiplicazione dei pani e dei pesci" by Battista Casone. One of the most precious element is a 14th century beautiful crucifix made of wood and nicknamed the "Venerabile". After its repair, the crucifix got the original splendour and it is possible to admire Jesus' contratct face. Finally, tourists should observe all the details of the three main doors: two are made of wood and the central one of bronze. During the Second World War, the church was destroyed almost antirely, but recently an architect called Franco Oliva, invented the original façade with black and white bands in order to imitate the Genoese Gothic style. Saint George church is a beautiful religious building located in Portofino. The building is really ancient and overlooks the wonderful Tigullio gulf. According to a memorial tablet, the church was built in 1154 in Romanesque style, even if some excavation allowed to discover an ancient square chapel which probably dated back to Lombards' period. During the Second World War the church was entirely destroyed by bombings and only in 1950 it was rebuilt by means of inhabitants' funds. Furthermore, this structure is considered an important attraction of Ligurian coast, because of the Saint George's relic, the patron saint of Portofino. 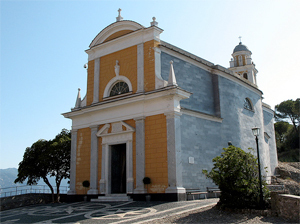 St.Peter Church, is sheer located on the rocks overlooking the gulf of La Spezia. 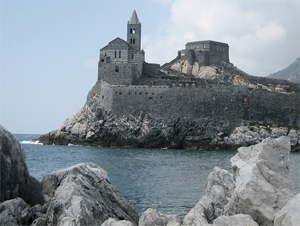 It is considered one of the most beautiful places in Liguria and belongs to the UNESCO world heritage. Every year, the church hosts lost of couple's weddings, because of its wonderful dream setting and landscape. Actually, it rises among huge rocks and long uphill stairs, while the Ligurian sea reigns on the background. For these reasons, it is said the building is an ideal point of union among heaven, earth and sea. Besides its aestethic beauty, the church is also famous for its history and architecture. St. Peter was built on an ancient temple of the goddes Venere Ercina, which was converted in the V century in an Early Christian basilica. The present St.Peter church was constructed only between 1256 and 1277 by Genoeses in honour of the victory over Pisa. During the Napoleonic period the building was used as a sort of fortresses to defend the gulf and remained extremely ruined untill it was restored in 1934. The church is characterized by the genoese-gothic style with balck and white bands and has a particular shape: there's a lateral entry with a perfect ractangular plan (a clear example of the early christian style)and an ancient bell tower with church windows. Behind the church tourists can see rests of cylinder-shaped walls which were sighting mills. Finally, a wondferful loggia overlooks the Ligurian sea..a fantastic view! The sanctuary of Nostra Signora delle Grazie is an ancient convent surrounded by olive grove, in the village of Portovenere. According the historical sources, the church was founded monks from San Colomabano who came from the isle of Tino and moved towards the inlet of Grazie in the XI century. From an artistic point of view,the church is in a late gothic style and has only one nave with groin vault. It is really interesting to see also the paintings on wood and the wonderful cycle of fresco paintings, where you find also the death of Jesus. Nowadays, the ancient convent has become a private home. However, it is possible to admire the original cloister and the refectory in its total integrity.Tourists should visit it during the celebration of Mary's Nativity on 8 September.